The IBM® WebSphere® DataPower® B2B Appliance XB60 is a purpose-built, easy-to-use appliance that incorporates business-to-business (B2B) and integration functions into a consolidated B2B-i solution, providing a high-performance and security-enhanced B2B solution for trading partner connections. 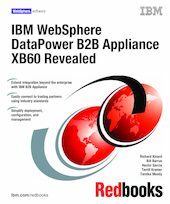 Part 1 of this IBM Redbooks® publication provides a brief introduction to B2B and how the technology has evolved over the years along with a description of the most common B2B technologies and an overview of the IBM Software Services for WebSphere B2B Deployment methodology. Part 2 of this book provides step-by-step information related to the installation and configuration of the appliance and troubleshooting tips to use to resolve common configuration issues. Part 3 of this book provides common B2B scenarios that demonstrate how to integrate with other IBM products and how to trade EDI, XML, and binary data utilizing AS2 and AS3 B2B messaging protocols. This book was developed as a guide for anyone who is interested in deploying B2B integration solutions utilizing purpose-built appliances.